Dehydration is the loss of water and salts essential for normal body function. Dehydration occurs when the body loses more fluid than it takes in. This condition can result from illness; a hot, dry climate; prolonged exposure to sun or high temperatures; not drinking enough water; and overuse of diuretics or other medications that increase urination. Dehydration can upset the delicate fluid-salt balance needed to maintain healthy cells and tissues. Water accounts for about 60% of a man's body weight. It represents about 50% of a woman's weight. Young and middle-aged adults who drink when they're thirsty do not generally have to do anything more to maintain their body's fluid balance. Children need more water because they expend more energy, but most children who drink when they are thirsty get as much water as their systems require. Adults over the age of 60 who drink only when they are thirsty probably get only about 90% of the fluid they need. Developing a habit of drinking only in response to the body's thirst signals raises an older person's risk of becoming dehydrated. Seniors who have relocated to areas where the weather is warmer or dryer than the climate they are accustomed to are even likelier to become dehydrated unless they make it a practice to drink even when they are not thirsty. Dehydration in children usually results from losing large amounts of fluid and not drinking enough water to replace the loss. This condition generally occurs in children who have stomach flu characterized by vomiting and diarrhea, or who can not or will not take enough fluids to compensate for excessive losses associated with fever and sweating of acute illness. An infant can become dehydrated only hours after becoming ill. Dehydration is a major cause of infant illness and death throughout the world. Mild dehydration is the loss of no more than 5% of the body's fluid. Loss of 5-10% is considered moderate dehydration. Severe dehydration (loss of 10-15% of body fluids) is a life-threatening condition that requires immediate medical care. When the body's fluid supply is severely depleted, hypovolemic shock is likely to occur. This condition, which is also called physical collapse, is characterized by pale, cool, clammy skin; rapid heartbeat; and shallow breathing. Blood pressure sometimes drops so low it can not be measured, and skin at the knees and elbows may become blotchy. Anxiety, restlessness, and thirst increase. After the patient's temperature reaches 107 °F (41.7 °C) damage to the brain and other vital organs occurs quickly. Strenuous activity, excessive sweating, high fever, and prolonged vomiting or diarrhea are common causes of dehydration. So are staying in the sun too long, not drinking enough fluids, and visiting or moving to a warm region where it doesn't often rain. Alcohol, caffeine, and diuretics or other medications that increase the amount of fluid excreted can cause dehydration. An infant who does not wet a diaper in an eight-hour period is dehydrated. The soft spot on the baby's head (fontanel) may be depressed. Symptoms of dehydration at any age include cracked lips, dry or sticky mouth, lethargy, and sunken eyes. A person who is dehydrated cries without shedding tears and does not urinate very often. The skin is less elastic than it should be and is slow to return to its normal position after being pinched. Dehydration can cause confusion, constipation, discomfort, drowsiness, fever, and thirst. The skin turns pale and cold, the mucous membranes lining the mouth and nose lose their natural moisture. The pulse sometimes races and breathing becomes rapid. Significant fluid loss can cause serious neurological problems. The patient's symptoms and medical history usually suggest dehydration. Physical examination may reveal shock, rapid heart rate, and/or low blood pressure. Laboratory tests, including blood tests (to check electrolyte levels) and urine tests (e.g., urine specific gravity and creatinine), are used to evaluate the severity of the problem. Other laboratory tests may be ordered to determine the underlying condition (such as diabetes or an adrenal gland disorder) causing the dehydration. Increased fluid intake and replacement of lost electrolytes are usually sufficient to restore fluid balances in patients who are mildly or moderately dehydrated. For individuals who are mildly dehydrated, just drinking plain water may be all the treatment that is needed. Adults who need to replace lost electrolytes may drink sports beverages (e.g., Gatorade or Recharge) or consume a little additional salt. Parents should follow label instructions when giving children Pedialyte or other commercial products recommended to relieve dehydration. Children who are dehydrated should receive only clear fluids for the first 24 hours. A child who is vomiting should sip one or two teaspoons of liquid every 10 minutes. A child who is less than a year old and who is not vomiting should be given one tablespoon of liquid every 20 minutes. A child who is more than one year old and who is not vomiting should take two tablespoons of liquid every 30 minutes. A baby who is being breast-fed should be given clear liquids for two consecutive feedings before breastfeeding is resumed. A bottle-fed baby should be given formula diluted to half its strength for the first 24 hours after developing symptoms of dehydration. In order to accurately calculate fluid loss, it's important to chart weight changes every day and keep a record of how many times a patient vomits or has diarrhea. Parents should note how many times a baby's diaper must be changed. Children and adults can gradually return to their normal diet after they have stopped vomiting and no longer have diarrhea. Bland foods should be reintroduced first, with other foods added as the digestive system is able to tolerate them. Milk, ice cream, cheese, and butter should not be eaten until 72 hours after symptoms have disappeared. Severe dehydration can require hospitalization and intravenous fluid replacement. If an individual's blood pressure drops enough to cause or threaten the development of shock, medical treatment is usually required. A doctor should be notified whenever an infant or child exhibits signs of dehydration or a parent is concerned that a stomach virus or other acute illness may lead to dehydration. When treating dehydration, the underlying cause must also be addressed. For example, if dehydration is caused by vomiting or diarrhea, medications may be prescribed to resolve these symptoms. Patients who are dehydrated due to diabetes, kidney disease, or adrenal gland disorders must receive treatment for these conditions as well as for the resulting dehydration. Gelatin water can be substituted for electrolyte-replacement solutions. It is made by diluting a 3-oz package in a quart of water or by adding one-quarter teaspoon of salt and a tablespoon of sugar to a pint of water. Mild dehydration rarely results in complications. If the cause is eliminated and lost fluid is replaced, mild dehydration can usually be cured in 24-48 hours. Vomiting and diarrhea that continue for several days without adequate fluid replacement can be fatal. The risk of life-threatening complications is greater for young children and the elderly. However, dehydration that is rapidly recognized and treated has a good outcome. Patients who are vomiting or who have diarrhea can prevent dehydration by drinking enough fluid for their urine to remain the color of pale straw. Ensuring that patients always drink adequate fluids during an illness will help prevent dehydration. Infants and young children with diarrhea and vomiting can be given electrolyte solutions such as Pedialyte to help prevent dehydration. People who are not ill can maintain proper fluid balance by drinking several glasses of water before going outside on a hot day. It is also a good idea to avoid coffee and tea, which increase body temperature and water loss. Patients should know whether any medication they are taking can cause dehydration and should get prompt medical care to correct any underlying condition that increases the risk of dehydration. "Hydration—Getting Enough Water." Loyola University Health System. May 13, 1998. http://www.luhs.org. Electrolytes — Mineral salts, such as sodium and potassium, dissolved in body fluid. removal of water from the body or a tissue; or the condition that results from undue loss of water. diarrhea in infants is a common cause of this. Severe dehydration is a serious condition that may lead to shock, acidosis, and accumulation of waste products in the body (as in uremia), sometimes resulting in death. Water accounts for more than half the body weight. Under normal conditions, the total 24-hour output of fluid in urine and feces and through the lungs and skin is about 2500 ml in adults. To make up for this loss, the same amount must be taken in to maintain fluid balance. When the fluid intake is insufficient or the output is excessive, deficient fluid volume occurs. 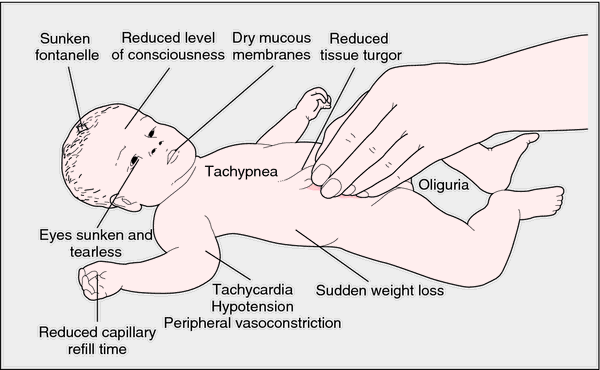 Clinical features of dehydration in an infant. From Lissauer and Graham, 2002. 1. removal of water from a substance. 2. the condition that results from excessive loss of body water. hypernatremic dehydration a condition in which electrolyte losses are disproportionately smaller than water losses. 2. Excessive loss of water from the body or from an organ or body part, as from illness or fluid deprivation. 1 excessive loss of water from body tissues. Dehydration is accompanied by a disturbance in the balance of essential electrolytes, particularly sodium, potassium, and chloride. It may follow prolonged fever, diarrhea, vomiting, acidosis, and any condition in which there is rapid depletion of body fluids. It is of particular concern among infants and young children because their electrolyte balance is normally precarious. Signs of dehydration include poor skin turgor (not a reliable sign in the elderly), flushed dry skin, coated tongue, dry mucous membranes, oliguria, irritability, and confusion. Normal fluid volume and balanced electrolyte values are the primary goals of therapy. 2 rendering a substance free from water. Also called anhydration. Internal medicine The loss of intracellular water that leads to cellular desiccation and ↑ plasma sodium concentration and osmolality, often due to GI tract–eg, vomiting, diarrhea Clinical Rapid ↓ weight loss of 10% is severe, ↑ thirst, dry mouth, weakness or lightheadedness, worse on standing, darkened or ↓ urine; severe dehydration can lead to changes in the body chemistry, kidney failure, ±life-threatening Management Fluid replacement, 5% dextrose. Cf Volume depletion. Worldwide, the most common cause of dehydration is diarrhea. In industrialized nations, dehydration is also caused by vomiting, fevers, heat-related illnesses, diabetes mellitus, diuretic use, thyrotoxicosis, and hypercalcemia. Patients at risk for dehydration include those with an impaired level of consciousness and/or an inability to ingest oral fluids, patients receiving only high-protein enteral feedings, older adults who do not drink enough water, and patients (esp. infants and children) with watery diarrhea. The elderly (esp. those over 85) are increasingly hospitalized for dehydration. Dehydration is avoidable and preventable. Lengthy fasting before a procedure, long waits in emergency departments, or increased physical dependency (e.g., being unable to pour water from a bedside container) may place patients at risk. Nursing home residents are at higher risk for dehydration than older adults living independently, partly because of limited access to oral fluids. The elderly also are at risk because of reduced thirst-response, a decrease in total body fluids, and declining renal function. Clinical states that can produce hypertonicity and dehydration include a deficiency in synthesis or release of antidiuretic hormone (ADH) from the posterior pituitary gland (diabetes insipidus); a decrease in renal responsiveness to ADH; osmotic diuresis (hyperglycemic states, administration of osmotic diuretics); excessive pulmonary water loss from high fever (esp. in children); and excessive sweating without water replacement. Dehydration should not be confused with fluid volume deficit. In the latter condition, water and electrolytes are lost in the same proportion as they exist in normal body fluids; thus, the electrolyte to water ratio remains unchanged. In dehydration, water is the primary deficiency, resulting in increased levels of electrolytes or hypertonicity. The patient is assessed for decreased skin turgor; dry, sticky mucous membranes; rough, dry tongue; weight loss; fever; restlessness; agitation; and weakness. Cardiovascular findings include orthostatic hypotension, decreased cardiovascular pressure, and a rapid, weak pulse. Hard stools result if the patient's problem is not primarily watery diarrhea. Urinary findings include a decrease in urine volume (oliguria), specific gravity higher than 1.030, and an increase in urine osmolality. Blood serum studies reveal increased sodium, protein, hematocrit, and serum osmolality. Continued loss of water is prevented, and water replacement is provided as prescribed, usually beginning with a 5% dextrose in water solution intravenously if the patient cannot ingest oral fluids. Once adequate renal function is present, electrolytes can be added to the infusion based upon periodic evaluation of serum electrolyte levels. Health care professionals can prevent dehydration by quickly treating causes such as vomiting and diarrhea, measuring fluid intake (and where possible urine output) in at-risk patients, providing glasses and cups that are light and easily handled, teaching certified nursing assistants (CNAs) and family care providers to record fluid intake, observing urine concentration in incontinent patients, offering fluids in small amounts every time they interact with an at-risk patient, encouraging increased amounts of fluids (at the patient’s preferred temperature) with and between meals and at bedtime (to 50 ounces or 1500 ml/D unless otherwise restricted), and offering preferred fluids and a variety of fluids (including frozen juice bars, water-rich fruits and vegetables), and assessing for excessive fluid loss during hot weather and replacing it. The willful refusal to eat, drink, or accept fluids from health care providers, sometimes used by the terminally ill to hasten death. A reduction in the normal water content of the body. This is usually due to excessive fluid loss by sweating, vomiting or diarrhoea which is not balanced by an appropriate increase in intake. the process by which water is removed from any substance. It is utilized in freeze-drying for the preservation of materials, and in the removal of water from microscopical preparations where it is necessary to use substances which are immiscible with water. in general, the process of removal or loss of water from a substance or body. For related terms used in the context of human fluid balance, see also hydration status. (dē-hī-drā'shŭn) Avoid the jargonistic use of this word as a synonym of thirst. 4. Used in emergency departments to describe a state of water loss sufficient to cause intravascular volume deficits leading to orthostatic symptoms. n 1. the removal of water (e.g., from the body or tissue). n 2. a decrease in serum fluid coupled with the loss of interstitial fluid from the body. It is associated with disturbances in fluid and electrolyte balance. n the drying of gingival tissue, leading to a lowered tissue resistance, which can result in gingival inflammation; seen in mouth breathing. See also breathing, mouth and oral cavity. the state when the body loses more water than it takes in. There is a negative fluid balance, so that the circulating blood volume decreases and tissue fluids are reduced and tissues are dehydrated. The clinical syndrome of dehydration includes loosening and wrinkling of the skin, and a bad skin-tenting reaction, in which a pinched-up fold of skin takes longer than normal to disappear; there is usually evidence of the cause of the dehydration, e.g. vomiting, polyuria. Clinical pathological tests are essential to determine the severity of the dehydration. caused by increased osmoconcentration of the extracellular fluid. Q. What Are The Signs of Dehydration? How can you tell if someone is dehydrated? Are there specific signs or symptoms that may help notice? A. 2 that I really notice when I am.... When you first stand up you feel dizzy, yet when you lay down you feel fine. My eyes sink back into their sockets. Q. Why does headaches are a symptom of dehydration? A few days ago I had a headache and a friend told me that I’m probably dehydrated and I should drink more. So I did and the headache was gone…how come? What is the connection? A. Headaches usually come from the tissues surrounding the brain. The brain itself can not feel pain. The tissues surrounding the brain (meningia) are filled with fluid named- Cerebro Spinal Fluid (CSF), when you are dehydrated the brain has a lot less liquid that will stand as a buffer between him and the skull. Thus every movement your head does will create pressure on the meningia and that hurts. Q. I heard that the major risk in diarrhea is dehydration, why is that? How can I avoid that? Are there other dehydration causes I should beware of? Prevention and protection from heatstroke is quite easy and the very first thing to remember is that heatstroke can be caused by rapid dehydration because the body needs water to cool down. This is one of the most serious - and sometimes life-threatening - complications of dehydration. The article "Rehydration with soft drink-like beverages exacerbates dehydration and worsens dehydration-associated renal injury" is published in the American Journal of Physiology -- Regulatory, Integrative and Comparative Physiology. Older People's Commissioner for Wales Sarah Rochira said: "While easy to prevent, dehydration is still an issue for too many older people receiving care and support in our hospitals and can have a significant impact on their health and wellbeing. Based on detailed literature survey, to the best of our knowledge, there is no existing data on the kinetic of isothermal dehydration of the PAM hydrogel or other hydrogels under the isothermal microwave heating. Overwintering larvae undergo another distinct form of dehydration, known as cryoprotective dehydration (Holmstrup et al. The researchers developed a rapid dehydration technique for cranberries using microwaves and osmotic dehydration, as well as microwave-vacuum technology, as the primary and secondary drying steps, respectively. KNOW THE BENEFITS |APART from staving off dehydration, keeping your fluid levels topped up has added bonuses too. Thrombolytic therapy had been administered in 40% of those with dehydration and 60% of those without it. At the end of the study, contradicting the popular belief that linked coffee intake to dehydration, researchers couldn't find any solid evidence to prove that coffee consumption can cause dehydration. We usually think of dehydration as something that takes place during the hot summer months.